Selling and delivering a project to a satisfied client, and making a profit, is a complex task. Project manager and author Robin Hornby believes this has been neglected by current standards and is poorly understood by professionals in the field. Commercial Project Management aims to rectify this deficiency. As a unique 'how-to' guide for project and business managers, it offers practical guidance, and a wealth of explanatory illustrations, useful techniques, proven checklists, real life examples, and case stories. It will give project managers a needed confidence boost and a head start in their demanding role as they go 'on contract'. At the heart of Robin's approach is a vendor sales and delivery lifecycle that provides a framework for business control of projects. Unique elements include the integration of buyer and vendor project lifecycles, the recasting of project management as a cyclic set of functions to lead the work of the project, and the elevation of risk assessment from a project toolkit to a fundamental control process. Beyond project management, the book proposes a comprehensive template for the firm whose business is delivering projects. This is a how-to book for project and business managers working in a commercial environment looking for practical guidance on conducting their projects and organizing their firm. Hornby's comprehensive guidebook will be of lasting value to experienced project managers and invaluable to those making the transition to commercial or business management positions. Drawing on extensive experience in software services, he critiques established tools and techniques, offering advice on when to follow and when to avoid or adapt. His professionalism, mastery of the subject, but above all his plain common sense, shine through. Hornby is sound on Risk, Estimating, and Quality. The book addresses the crucial question: how can services companies, especially software services companies, grow profitably and safely as the scale and number of the projects undertaken outstrips the ability of the founder business owners to take or even monitor every key decision? This reviewer exited profitably from two software start-ups. Hornby's insights on building a successful services firm might well have inspired and enabled us to grow rather than sell. 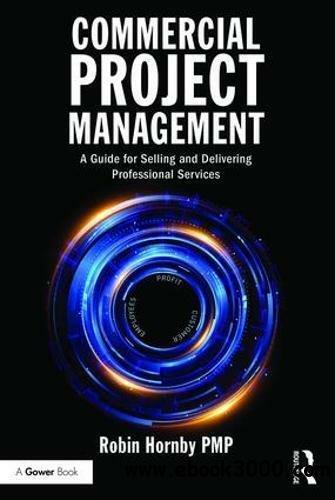 In Commercial Project Management, Robin Hornby, a project management authority and author, gives the reader a very complete view of the business management of projects from the professional service firm's perspective. His tips and templates on topics such as bidding, client engagement, and risk and quality management are practical and will help even the smallest vendor firm win more contracts and execute them successfully. His chapter on 'Building a Successful Services Firm' is worth the price of the book alone. This is a must-have book for any small- to medium sized-services firm that wishes to improve their practices. I don't know of a finer framework for delivering professional services-based projects, getting paid and making a profit, than Robin Hornby's. We implemented most of these processes and techniques presented in the book and reaped the benefits over the long run. Over time, we organized our entire operations around the main theme of Commercial Project Management, which is managing through all phases of the vendor lifecycle. This is a must-read for all who desire to implement superior commercial project management practices. It is refreshing to find in this latest book, Commercial Project Management by Robin Hornby, a side of project management that is rarely tackled. In fact, it is not about project management per se, but rather about how to make money, or certainly not lose it, in the provision of real commercial project services in the course of 'Business as Usual'. Robin's book is written in clear straight forward language and follows the natural work flow of this type of business. It includes an introduction to projects as a business and works its way through buyer/vendor relationships, the natural life span of managing a project contract in all its dimensions, to project-contract closure, including handling all of the financial side. Based as it is on his personal experiences, the book provides extensive practical and exhaustive advice to those working in the project management services industry with a view to making money, or contemplating doing so. Highly recommended.